I tried to make my own soil block recipe back here. 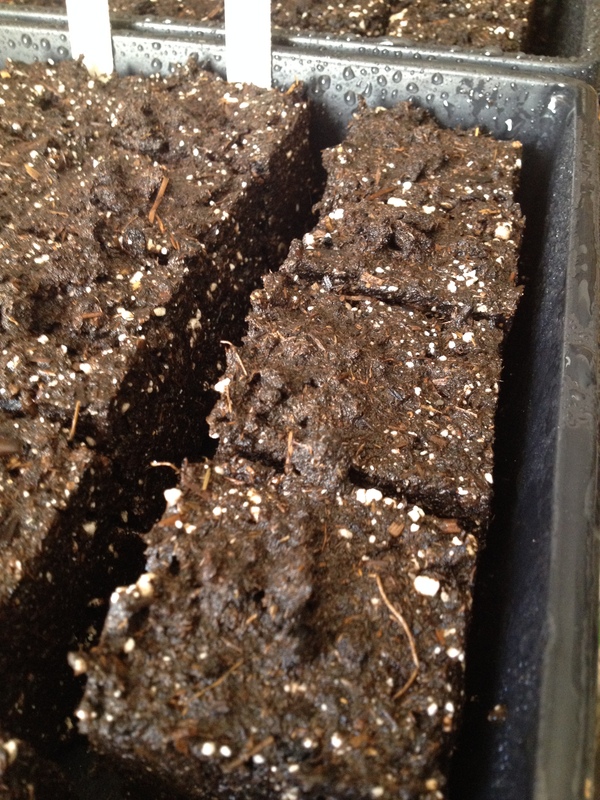 Germination rate was bad, the look of the blocks was bad, they were just… well bad. I had it in my head that peat was bad and stinky, from some of the things I had been reading. Some of my great readers here tried to steer me back on this, but… I wasn’t listening real good. I did find what appears to be a decent recipe for soil blocks made from coir here, but by that time I had already convinced myself that I needed to go with a more traditional recipe. I was looking for a slam dunk, people. I really didn’t want a strike two. (Ugh… I’m mixing sports metaphors now). So I went to Depot and of course they didn’t have half of the stuff I needed so I ended up driving clear across town to one of my favorite gardening stores, Treeland Nursery where they had… everything. Sweet, I love that. Now, I have a confession, I’m a garden video watching junky… well, maybe not junky, but they are really entertaining. There was an old gardening show called Gardening Naturally with Elliot Coleman. There are bits of this show all over youtube. In this one Elliot does a great job demonstrating the soil blocks and gives the recipe for his blocks. PERFECT! So I followed his video and recipe exactly, except that I added rock dust, and made 131 soil blocks this weekend (I accidentally smooshed one of the blocks or it would have been 132). I planted them out with some help from a couple of the kids. Most of the plantings are a match to what I just planted in the garden to make up for some of the open spaces I have where seeds didn’t germinate. Now there is nothing quite like the look and feel of these when you are mixing them up. Something about good soil. However, the smell is really what gets you. I love it. Everybody else thought it stunk like… well… poop. Wet peat definitely has a bit of a swampy odor to it. Throw in some wet compost and… Anyway, I like the smell but I was probably the only one. I LOVE the look of these blocks, well formed, nice sharp corners and edges. I’ve even picked a few up to see how well they stick together and they are AWESOME! Wahoo! 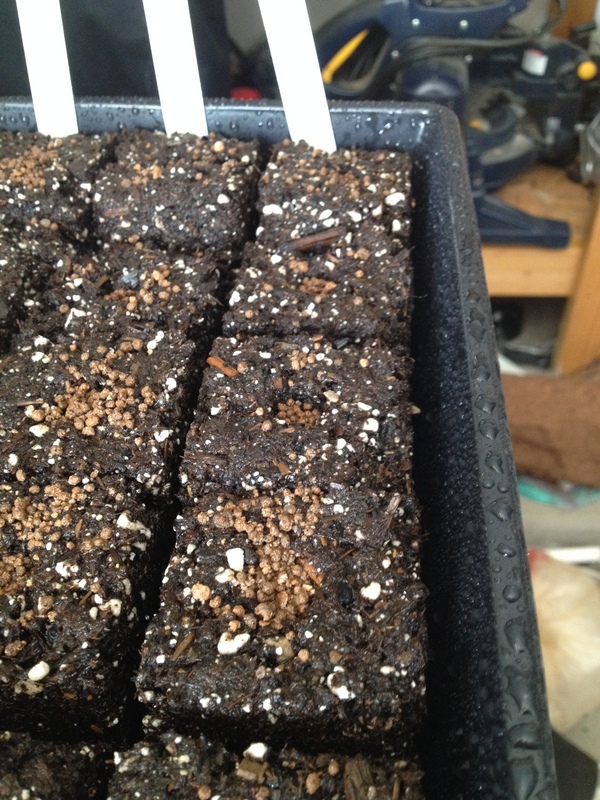 One thing that I saw different between a lot of the soil block videos (by the way I didn’t make a video because, well, it would have looked just like Elliot Coleman’s video without all the flowing hair) was that there was a lot of variation between the seed covering that people used. Some didn’t use anything (which seemed to weird) and other people used peat, soil, vermiculite… so I tried a couple of different things. Some I put my granulated rock dust on and the rest I just covered with some soil. I had seen a video where somebody experimented growing plants in up to 50% rock dust so I thought it would be an interesting data point. In any case, I can’t wait until they sprout! This entry was posted in Elliot Coleman, seed blocks. Bookmark the permalink. Congrats on your second-round success! Thanks! I can’t wait until they sprout! O those look great! I will be following on how this goes, I like the idea of soil blocks, I want to use them get the plants started before transferring them into the big large round straw bales for growing, the ones that were seed planted didn’t do as well as the ones that were greenhouse started and transplanted, good to know for next year! Thank you! If nothing else they are really fun to make. Nice. I might have to try that next spring.